Yesterday, I talked a little about the aftermath of Ophelia’s “mad” scene in Act Four, Scene Five of Hamlet: the account of her death, delivered by Gertrude, two scenes later in Act Four, Scene Seven. I proposed that Ophelia took her life, desperate because of an unplanned pregnancy and the ineffectiveness of her chemical abortion, both lying on top of the foundation of her father’s death and her lover’s forced departure. I also noted that because of the specificity of Gertrude’s account, I feel that she must have been a first-hand witness to the act. Gertrude describes a willow that is next to a brook or stream. Ophelia, at this willow, made fantastic wreaths and head-dresses from many kinds of flowers. Ophelia, trying to hang her flowers on a thin branch, climbed out onto the branch which then broke. She and her artifacts then fell into the brook. Her clothes spread out from her, and for a while they held her above the water, and during this time she sang like someone who is unafraid, or like a water creature. But the clothes soaked with water then pulled her from the surface to death. 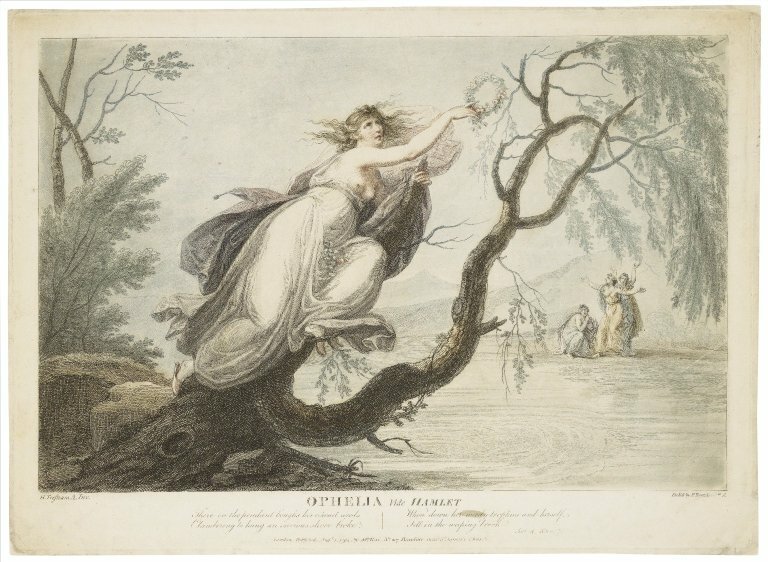 Folger Digital Image Collection: Ophelia … [character in] Hamlet [graphic] / H. Tresham A., inv. ; etch’d by F. Bartolozzi R.A.
How exactly is this suicide? If suicide is “an act of taking one’s own life, self-murder” (“suicide, n.; 2.a.” Oxford English Dictionary Online. Oxford University Press, June 2014. Web. 15 July 2014. ), then this doesn’t seem like suicide. She crawled out on a branch, it broke, and she drowned. Accidental. But then why is Gertrude there, if not to assist? To verify? And if so, of what? That the suicide succeeded? Or to come back with a story of accidental death? Is the verification needed to ensure a burial with full Christian rites? For here lies the point: if I drown myself wittingly, it argues an act, and an act hath three branches—it is to act, to do, to perform. Argal, she drowned herself wittingly. Give me leave. Here lies the water; good. Here stands the man; good. If the man go to this water and drown himself, it is (will he, nill he) he goes; mark you that. But if the water come to him and drown him, he drowns not himself. Argal, he that is not guilty of his own death shortens not his own life. I find amusing the Gravedigger’s use of “branches” as if he knew the cover story. Then the discussion of the separate locations of the water and the victim and which goes to meet which. In a sense, the water did come to Ophelia. But it doesn’t matter now, there will be no rites. Gertrude fails in both not keeping Ophelia safe and alive, as well as not being able to make her spiritual trip to the afterlife a religious one. What guilt might Gertrude have felt? And is that why she “pray(s)” for a kingly “pardon” (both V.ii.274) from Claudius as she drinks the poisoned cup? Does she pray for his pardon because she knows that she will not receive one from God? Does she drink the poison knowingly, seeking to follow her fallen sister? 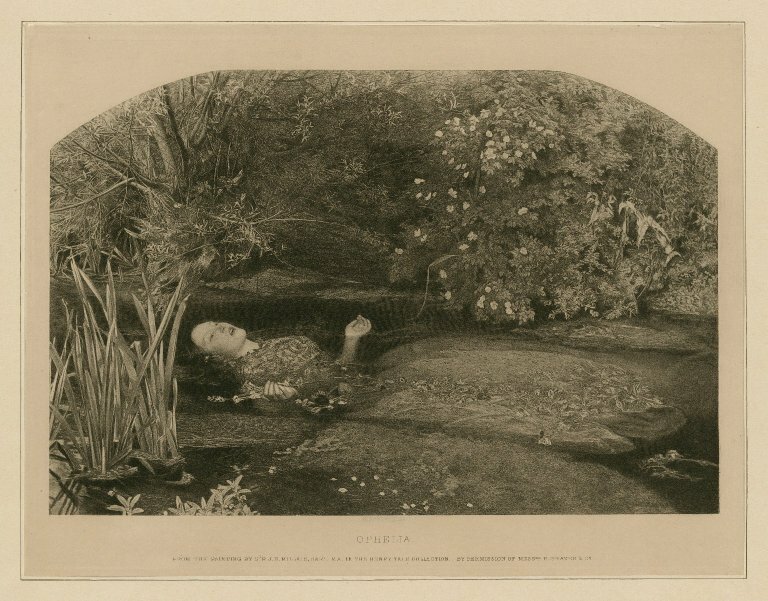 Folger Digital Image Collection: Ophelia [character in Hamlet] [graphic] / From the painting by Sir J. E. Millais, bart. Oh, Shakespeare, all I wanted was a Pepsi, but you wouldn’t give it to me. Instead, you just leave me with more questions.